Okay, it’s not much of a dinner. But it was cheap and really easy to fix. 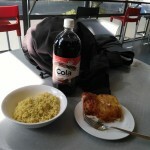 I picked up some noodles, a bottle of soda and a slice of pizza from the local grocery store on my way back to the hostel. It only too a few minutes to fix it. Was it good? What I’ve ldarned over the years is that when a person is hungry, almost anything tastes good. I think the whole meal cost me about $1.50. I can live with that periodically. 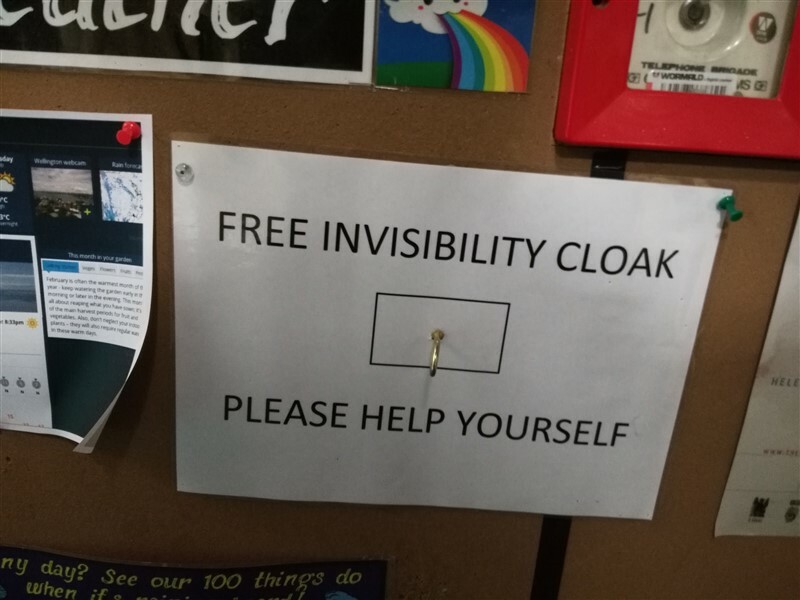 At first I wondered where the cloak was. Okay, so maybe I didn’t. But I like the concept. 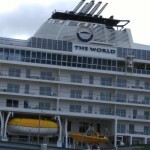 It’s one of the great cruise ships of today. It’s named The World and it’s not really for hire. Well, i guess maybe it is but it’s pretty pricey. 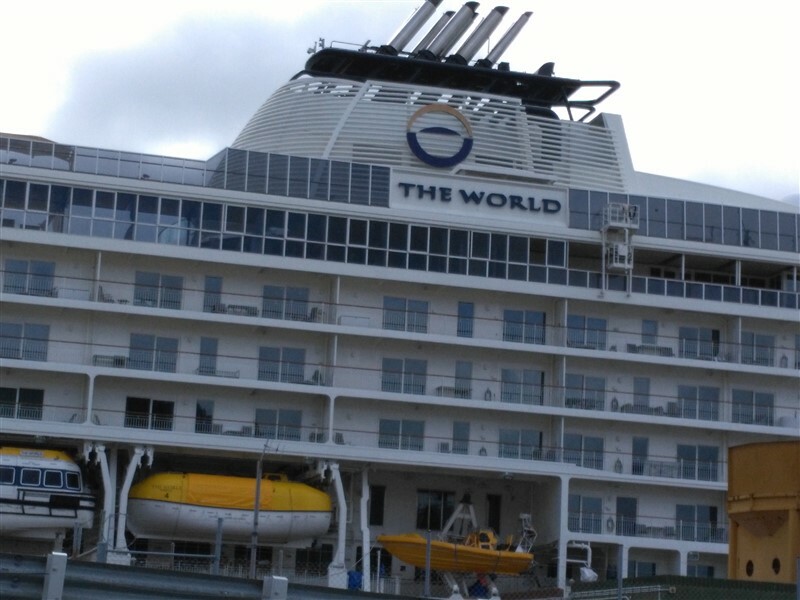 The World is a private cruise ship for some of the wealthiest people in the world. The story of the World is here. I saw the ship on my way into Wellington and I had to make an effort to try and get to check it out. Don’t get me wrong. I’m not interested in living abourd the ship. I’m just interested in the story of those who do live aboard the ship. It was an excellent day. It started off a little slow. I got up early and spent some time trying to figure out why my cell phone would not let me utilize the Wi-Fi connections I tried to log into. Eventually, I figured out that Skype was the culprit. As soon as I removed it my problem was no more. By that time I was ready for a shower and a nap. I had gotten up too early. 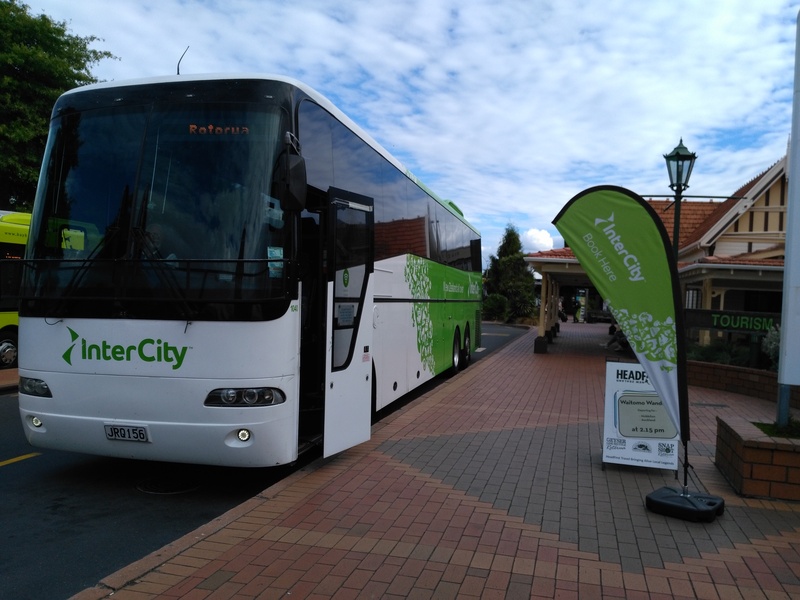 Once I got going and got my body moving at a normal pace I went to the Rotorua, New Zealand Tourist Information Center and got some really good advice on what to see and do in Rotorua. 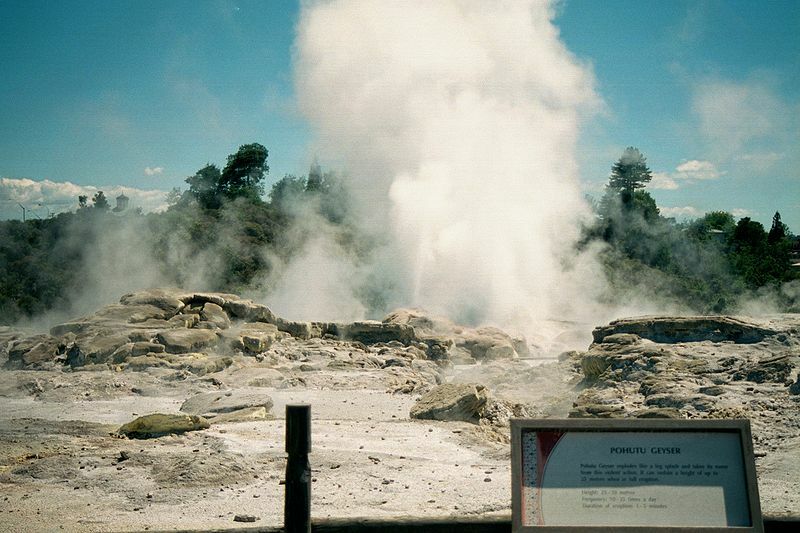 Rotorua happens to be one of the world’s most significant areas for geothermal activity. The Waimangu Geyser, which is currently dormant, is generally regarded as the most significant geyser in recorded history. Some of its blasts were recorded to have went as high as 1,500 feet. The Waimangu Geyser is less than 20 miles form Rotorua. Two other currently active geysers, Lady Knox Geyser and the Pohutu Geyser are rated as world class geysers and are very close to Rotorua. The Lady Knox Geyser is within 20 miles of Rotorua and the Pohutu Geyser is within walking distance of downtown Rotorua. Most people opt for the tour package at Whakarewarewa, the #1 tourist attraction in Rotorua and the location of the the Pohutu Geyser. I opted for a stroll in Kuirau Park, a local public geothermal park located about 100 yards from where I was staying. That made it really easy to get there and get back. The cost was also really good. It was free. I got lots of pictures and some videos. The whole experience perked my interest in geothermal activity. 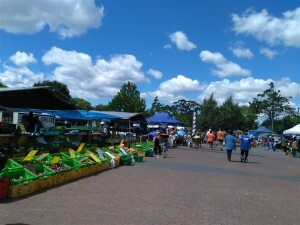 The highlight of the day, however, may have been the serendipitous encounter with the local Saturday market at the park. I simply stumbled across it where exploring Kuirau Park. It was obvious that it was one of those events that happened to be a regularly scheduled event. There were hundreds of people there and, after scoping out some of the food vendors, I understood why. It was more of a food fair and an art-and-crafts event than a simple Saturday flea market, although there were vendors selling who-knows-what for professional looking setups to locals spreading out their wares on blankets. I had a good time checking out the activity. This entry was posted in Travel and tagged Asia 2017 on February 11, 2017 by Steve. Okay, I did it. I was able to use Google Voice to call a number on my cell phone using Wi-Fi. I love my new phone, the Honor 5X. It’s terrific. But, it does not have built-in support for Wi-Fi calling. That means that I need a third-party app to do the calling for me when I’m outside of the U.S. and don’t want to spend money on each phone call, sometimes to the tune of ridiculousness. I installed the Skype app on my phone and it crashed all my Wi-Fi. Whenever I would try to use a Wi-Fi connection and it told me I connected it wouldn’t actually do any sending or receiving of any data as long as I had Skype installed. I tried connecting at several places and then tried to use several different apps to access the Internet and the results were the same – I got a connection message but no data movement. I kept beating my head against the wall trying to figure out what had happened until I realized that the problem had only begun happening since I installed Skype on my cell phone. Once I uninstalled Skype the problem went away. Thank God. So, what to do? I wanted to make Wi-Fi calls from my cell phone. Skype worked fine on my laptop but I didn’t want to drag out my laptop every time I wanted to make a Wi-Fi call. I decided to try Google voice. I set up an account. I logged in. Then I had to figure out how to make a call. It worked the first time I tried. Sweet. Now that I know what to do I’m going to keep using it to increase my skill level. Don’t be surprised if I call you. This entry was posted in Travel on February 10, 2017 by Steve. This is the bus that I took to Rotorua. It was about a 6 hour trip through the countryside with stops in several towns. I took the bus to move on out of Auckland. Rotorua was the next stop on my itinerary. The bus was comfy but the driver was kind of a jerk. He got onto some guy for bringing a sandwich on the bus and when I asked him a question he said “Can’t you see that I’m busy?” I wanted to retort that I could but wondered why he thought that anything he was doing was more important than providing customer service. Luckily, I only paid $1 AUD (about 70 cents) for the trip. This is the McDonald’s I stopped at to work on some Wi-Fi issues I was having. I’ve found that food is more expensive in New Zealand than in the U.S. That applies to Micky D as well. 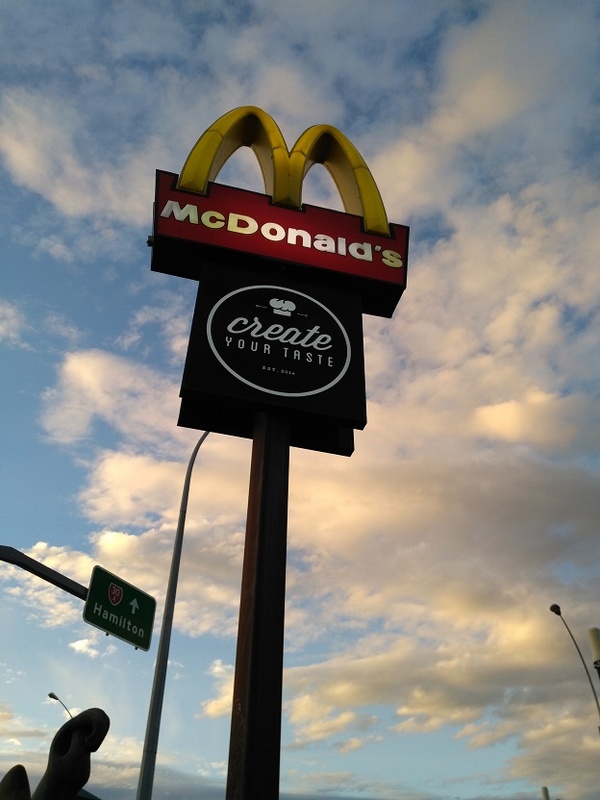 While I didn’t get my Wi-Fi issues solved I did find that I could get a Senior Coffee in New Zealand just like I did in the U.S. and, what’s even better, it was free at this McDonald’s. 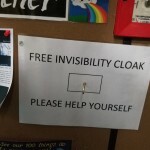 I like free. I don’t know if a Senior Coffee is free at all McDonald’s in New Zealand but I’m going to try and find out. 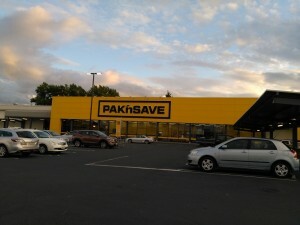 This is the PAK’nSAVE I found across the street from the McDonald’s. 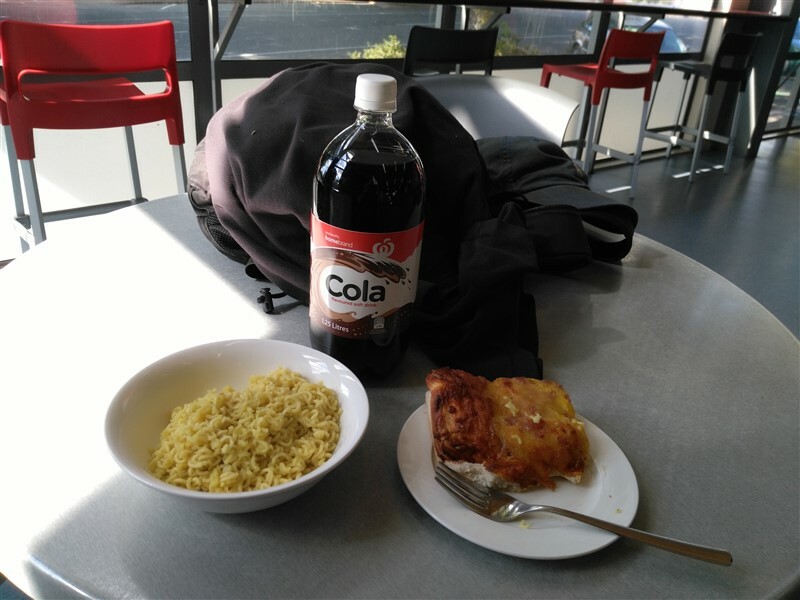 I took the opportunity to get some instant coffee, some instant noodles, some chocolate and a cheap bottle of soda pop for dinner. Actually, the noodles and chocolate will last several days and the coffee will last me a couple of weeks. Little expenditures like this dramatically help me to control my costs even though they aren’t as satisfying nutritionally or psychologically as a meal at a nice restaurant. This entry was posted in Travel and tagged Asia 2017 on February 10, 2017 by Steve. American TV Outside of the U.S. Sometimes I’m more than a little naive. Sometimes I almost feel like I’m stupid. I was going to say that I know I’m not but, I reconsidered and said to myself that, on occasion, I really do appear to be. All this self-doubt is because I wanted to watch a recent episode of Chicago P.D. and found that I couldn’t. When I went to NBC to watch the program they said “Sorry, this video is not available from your location.” Okay, I can buy that. I then went to Directv, my TV service provider, and told them I would like to stream Chicago P.D. and they also told me that I couldn’t, no matter how much I paid them every month. So now I’m thinking “What do I do? What do I do? What do I do?” like some kind of an addict going through withdrawal. Only, I’m not really an addict. I just want an hour of mindless dribble to pacify my need to escape the endless realities of my not being King of the World. Yes, I have the program recorded at home, but I won’t be there for a while. I can live without Chicago P.D. for a few weeks. But there’s no way that I can go without being able to fantasize about being Raymond Reddington for that long. I’m not asking much. I just want a small sliver of pleasure in my existence. Just an hour’s worth. I’ll watch the commercials. I’ll even promise to buy one or more of the products advertised. I just want to watch a little American TV. Is that so hard? So what am I going to do? I guess it’s time for a VPN. I’m thinking I might try this one. This entry was posted in Travel on February 9, 2017 by Steve. I Googled “World’s Great Drives” to see what was out there. What did I find? Absolutely no consensus. It seems there is a good deal of disagreement about what constitutes a great drive. For many, it’s altitude. Find a place where the air is thin and you’ll probably have some great views.There are some drives in the world that actually go over locations that are higher than 15,000 feet in elevation. Why is that significant? Because, as anyone that’s had training as a pilot knows, that’s when you need to start giving some serious consideration to putting your oxygen mask on. For others it’s switchbacks. There are even people who calculate the average number of seconds between turns of a certain number of degrees. For them, a great road is a road that minimizes the number of seconds between changes in directions of 90 degrees or more. How weird is that? For some people that most significant criteria is that the road needs to be closed for an extended period of time during the year. This is another criteria that is a function of elevation, only even more so. This is for really obscure roads that can only be driven certain times of the year due to significant snowfalls during the winter months. Luckily, a lot of people think like I do. I want a road that’s scenic with ooohs and ahhhs happening as often as possible. I want little exclamations of delight from visual stimulation, not shrieks of terror from the fear of going over a cliff. I want a drive I can enjoy, not one that puts me on the edge of my seat. Anyway, I did some reading. I compiled a list of articles and many of the drives they cited. In the end, what I wanted was a drive that had a name. Think Route 66, my favorite road, one that I’ve driven on thousands of times as it runs very close too my home and one that we Americans affectionately refer to as The Mother Road. I’ve created a list of Roads. The most significant ones have a Wikipedia entry and a boatload of images. If you were to ask me if I saw any blatant sins of omission I’d state that I’m really fond of the cornich roads of the French Riviera. You pick the ones you like. Enjoy. Articles: The world’s 10 best drives – The Telegraph; The world’s most scenic drives – dangerousroads; The 10 best drives or roads in the world | ShortList Magazine; The 20 Greatest Driving Roads in the World; World’s best road trips: The top 10 drives – Traveller.com.au; 10 Most Beautiful Drives In The World – 10 Most Today; Top 25 driving roads – World’s best driving experience | Avis; The world’s greatest road trips | Photo Gallery | Rough Guides; Top 10: most scenic drives in the world – the Luxury Travel Expert; World’s 10 ultimate drives | CNN Travel and 21 Roads You Have to Drive in Your Lifetime «TwistedSifter. This entry was posted in Travel on January 26, 2017 by Steve. The Great Ocean Road is described as one of the World’s Great Drives.There are some web pages devoted to the drive and the two best ones I found were the Great Ocean Road, Victoria, Australia – Visit Victoria and the 1 Day Great Ocean Road & 12 Apostles Tour $96. The most prominent landmark on the road is The Twelve Apostles. There are many others. My map of the drive is located here. The Great Ocean Walk parallels the Great Ocean Road. It’s a walk of 65 miles. There is a documentary about the walk. If you have an Amazon Prime subscription you can see it for free. This entry was posted in Travel on January 25, 2017 by Steve. Lonely Planet Australia (Travel Guide) is available on Kindle Unlimited. Sydney is expensive. At least relative to lot of destinations that I will be seeing on this trip. The two main cost factors are lodging and transportation. 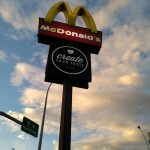 Airport to Sydney (and back): Viator transfers - $12.32: quick, easy-peasy. TripAdvisor has an excellent write-up on getting to/from Sydney/Airport - as cheap as $5. “Route 400 eastbound (Destination ‘Bondi Junction’) – Alight at Mascot Station for a train to the city (8 minute train, $2.36-3.38). Bus is 5min/$2.10 (from Domestic) and 19min/$3.50 from International.” AUD? Australia Tourism +61293601111 – not the most helpful. Sydney Tourism +611800067676 – not the most helpful. Transportation: Sydney has no subway. The tourism office tells me that bus service in the Sydney Central Business District is very bad due to construction. They say the Sydney Circle Line works best. It’s trains. The Opal Card visitor information webpage is located here. The webpage for planning a trip in Sydney is located here. My map for Sydney attractions is located here. Attractions: See my excellent article on Australia’s Attractions. Other atttractions pages are Fodor’s, Frommer, Planetware, TripAdvisor, Lonely Planet, and Wikitravel. When I leave Sydney I’m heading for Canberra in a car. I’m going to head for the Great Ocean Road. Leaving Sydney I need to think about rest stops. There are websites with listings of rest stops and they are located here and here and here. After leaving Canberra I’m heading to the Great Ocean Road. This entry was posted in Travel on January 24, 2017 by Steve. Lonely Planet New Zealand (Travel Guide) is available with Kindle Unlimited. Some good New Zealand Links: History, CIA, Hillman, UNESCO, Wikitravel, Attractions (Google), Images (Google), Landmarks (Google), LP, RG, Fodor, Frommer, Travel Guides, Backpacker, Hostels, Weather, Bus, Auto Rental, Camping, Ferries and, of course, Food. Arrive Auckland Wed @ 8:50 AM by plane. 1 NZD = $0.719805 USD. Booked YHA Auckland City 18 Liverpool St, Cnr City Road and Liverpool Street. Leave Fri for Rotorua. Bus at 12:45. YHA Rotura. Auckland Transportation: AT HOP day pass ($10 for card / $18 NZD per day.). Skybus $18 NZD one-way. Get a HOP card. “For central Auckland bus 380 departs every 30 min daily 05:08-23:38 from both the Domestic and International terminals and takes about 20min to Papatoetoe Train Station (bus stop 6480) from where suburban trains connect to Britomart station in another 33 min (if the schedules meet up).” Auckland Journey Planner. Buy the HOP card at the Auckland i-SITE Visitor Information Centre Auckland, New Zealand · +64 9-365 9914 9 AM | Auckland i-SITE Visitor Information Centre – SKYCITY +64 9-365 9918 | Auckland i-SITE Visitor Information Centre – International Airport Terminal +64 9-365 9925 6:00 AM. Auckland Attractions: See the map. Also see Auckland Things To Do and New Zealand Tourist Notes. Rotorua: Hostel is booked. Go see some geothermal activity. Attractions are located here. Wellington: Attractions map is here. Google attractions list. Airport flyer and regular service to airport. Queenstown: Queenstown is a bit cool during February. It has an average high of 61 deagrees and an average low of 50 degrees. Viator Milford Sound. This entry was posted in Travel on January 23, 2017 by Steve.